London's Livery Companies are the direct descendants of the medieval guilds - religious fraternities which grew up round the City’s churches in late Anglo Saxon times. After the Norman Conquest many of these began to develop into associations of workers in particular crafts or trades. The Anglo Saxon word "gild" meant "payment" and the members' subscriptions raised funds which could be used for social, charitable and trade purposes. One important use of the funds was to make a contribution to the Exchequer in return for which a Charter confirming certain privileges, rights or liberties would be granted by the King. It is the recording of such a payment, the first for any guild, which establishes the Weavers as London's oldest Company. 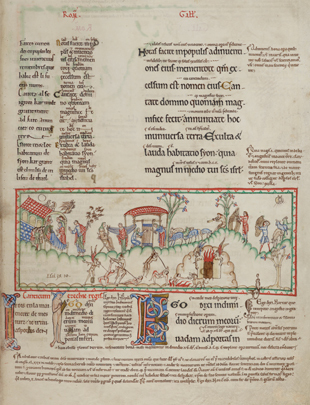 Before London Bridge was begun (1176), before the first Mayor, Henry FitzAilwyn, took office (1189), in a period so remote that medieval writers referred to it as "a time whereof the memory of man runneth not to the contrary", the Pipe Roll of 1130 has an entry of a payment of £16 by Robert Levestan on the Weavers’ behalf. The Pipe Roll was a roll of parchment on which payments into the Exchequer were noted. Twenty‑five years later the Weavers’ Guild was granted a charter by Henry II which stated "Know that I have conceded to the Weavers of London to hold their gild in London with all the liberties and customs which they had in the time of King Henry my grandfather". These liberties and customs included the rights to elect Bailiffs, supervise the work of their craft, punish defaulters and collect the ferm (tax). It is clear that by the mid‑twelfth century the Weavers’ Guild had established a monopoly of its craft in London and control of its members through its own Court. The only other guild to have its own Court was the Fishmongers'. As the original textile guild, the Weavers were very powerful, for the cloth trade was the basis of England’s economy throughout the middle ages. But their privileged position and independence of the civic authorities aroused the animosity of other citizens. Attempts were made to persuade King John to dissolve the Weavers’ Guild in return for a higher payment by the citizens. But the Weavers were wealthy enough to raise their own payment and the deal fell through. However, pressure on the Guild persisted during the thirteenth century, causing it so much concern that it deposited its Charter in the Exchequer to keep it safe from the civic authorities. In the early years of the fourteenth century the Weavers’ Guild submitted to the authority of the Mayor. In time it lost its pre‑eminence as other textile guilds developed, many of them powerful merchant companies like the Mercers, Drapers, Merchant Taylors, Haberdashers and Clothworkers. In 1321 the Court of Husting (early meetings of the Aldermen) declared it lawful for all Freemen to set up looms and sell cloth so long as the King received his yearly ferm. Try as it would, the Weavers’ Guild could not maintain complete control of its craft. Some weavers simply moved out to the country to evade the Guild’s control. In their place “aliens” moved in. These developments were particularly marked in the reign of Edward III, who recognised the national value of the cloth trade and was determined to promote it. He issued regulations forbidding the export of wool and the import of foreign cloth. Flemish weavers, already discontented with conditions in Flanders, were encouraged to bring their skills to England. Inevitably such competition was resented by English weavers. The Weavers were prevented by the King from forcing the foreign workers to join their Guild and pay dues. Instead Flemish workers were allowed to set up their own Guild and measures were introduced to protect them. Disputes continued for over a hundred years during which time many attempts were made to reach agreement. Eventually in 1497 a pact was made protecting the interests of both sides and absorbing the “aliens” into the Weavers’ Guild. 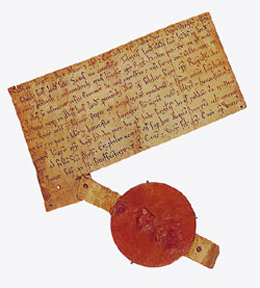 In the fifteenth century the greater guilds began to apply for charters of incorporation and so were officially recognised as Companies. The senior members of these Companies were clothed in the livery and the Companies were known as Livery Companies. The Weavers’ Guild relied on its ancient charters. In 1490 it obtained a Grant of Arms. In the early sixteenth century it claimed the status of an incorporated craft and in 1577 obtained from the City authorities ratification of its Ordinances. During this period the organisation of the Company was developing along lines we can recognise today. From the earliest days the governing officials were called Bailiffs, hence the Weavers’ Company’s distinction of being the only Company headed by an Upper Bailiff rather than by a Master or Prime Warden. There were also Wardens who directed social rather than industrial concerns, so there are references in the Company records to "Bailiffs of the Craft and Wardens of the Guild". Numbers varied in the early days but it was established from the beginning of the fourteenth century that there should be four officers of the Company, two Bailiffs and two Wardens. The Bailiffs looked after finance, receiving fines and fees for admission to the Freedom. They dealt with the enrolment of apprentices, who served for seven years, and the admission of journeymen. These according to late sixteenth-century ordinances must serve at least one year, be worth ten pounds and submit a masterpiece as proof of their work before admission to the status of master. The Bailiffs also controlled the arrangements for inspection and search, and regulations on standards and hours of work. The Wardens were concerned with the fraternal work of the guild, with charitable works and attendance at feasts and quarterly meetings. The Court of Assistants developed from a council of former office holders and was well established by the early sixteenth century. of one impressive guild fraternity. However, as time passed, the wearing of livery became the privilege of the senior members of the Companies, such as the masters of the craft who could sustain the expense and responsibility for running the Company. Thus by the beginning of the sixteenth century these formed the Livery of the Weavers' Company, distinct from the mass of members who benefited from the protection of membership and their status as Freemen but had no powers or privileges. The Ordinances of 1577 specified that the government of the Company should consist of two Bailiffs, two Wardens and a Court of 12 Assistants. The Court of Assistants chose the Clerk and the Beadle and formulated general rules for the government of the craft. They selected the Livery from among the general body of Freemen. In the early years of the sixteenth century the Weavers’ Company was in financial straits. Under Henry VIII difficulties over payment of the ferm were so severe that the King agreed to take a lower rate, it being recognised, at last, that the Company no longer enjoyed the extraordinary power which had justified the original heavy tax. This helped to alleviate its problems and it became more prosperous. However, it now had to cope with the new influx of foreign workers, Protestants fleeing from persecution on the continent. These were silk workers, bringing with them new skills, and although there was natural resistance to foreign competition the stimulus to trade given by the new materials led to greater prosperity. Londoners took up silk weaving and many foreign weavers were absorbed into the Company. In the second half of the sixteenth century the Company’s finances had so far improved that it was able to undertake the building of a hall. It had owned property in Basinghall Street since the fourteenth century, but the existing buildings were now pulled down and an entirely new hall built. From this headquarters it carried out its craft and charitable functions, with special attention to proper attendance at the funerals of members. The Weavers’ Company also had a vital role to play in the affairs of the City, with contributions to charitable causes in times of need, to the provision of corn and to loans and subsidies to the King. It contributed to the defence of the realm, for which it kept a stock of gunpowder and of arms. In war time it would send a contingent of men to fight in the King’s army. The Liverymen voted in Common Hall at the elections of the Lord Mayor and the Sheriffs and also for the City’s Members of Parliament. They played their part in the City pageantry with lavish feastings and displays on the Lord Mayor’s Day and on the occasion of royal visits. This civic pageantry was at its peak in the reigns of Queen Elizabeth I and King James I. But the seventeenth century was to prove a time of upheaval and of great financial strain for all Livery Companies, because of the hostility between King and Parliament which led to the Civil War and the Commonwealth period. The Restoration of Charles II in 1660 was welcomed with great joy and a magnificent parade in the City, with Liverymen lining the streets in their robes. Five years later the Great Plague struck, killing one third of London’s population. The areas where weavers lived and worked, Cripplegate, Whitechapel and Southwark, were particularly severely affected. Life was just beginning to return to normal in 1666 when on 2nd September in the early morning a fire started in a baker’s in Pudding Lane which in a few days destroyed most of the ancient city. On that day Weavers’ Hall was burnt down. The Company’s devoted Clerk, James Cole, with the help of the Beadle and the Porter managed to save the great chests containing the Company’s ancient charters, most of the records, plate and pictures, as well as two bags of gold which had been kept to repay debts. There was, of course, no insurance—the great fire gave the impetus to the formation of the first fire insurance companies—but funds were raised for the rebuilding of the hall through subscriptions and donations. On Election Day, 25th July 1669, the Weavers’ Company dined in its new hall. It was a remarkable effort; only five other Companies had rebuilt their halls before 1670. City pageantry revived and in 1673, having previously hired a barge for the water procession on Lord Mayor’s Day, the Company commissioned its own barge in which it sailed to Westminster every year until 1733 when the barge not the company had to be broken up. Throughout the seventeenth century foreign weavers continued to come to London, and were resented by native weavers. Fears were expressed about the immigrants’ credentials and the standard of their work. But there was a sense of obligation to help refugees. After Louis XIV of France revoked the Edict of Nantes in 1685, thousands of French Protestants (Huguenots) came to England. Many of them were skilled craftsmen: clock‑makers, jewellers, shipwrights, glassworkers and fine silk weavers. These last, able to produce gorgeous figured silks, gave a great impetus to the silk industry although such a huge influx was bound to upset the native weavers, many of whom complained of loss of employment and unfair competition. However, the immigrants settled down and established a French colony in Spitalfields. Many of them were admitted to the Weavers’ Company, but it was not until the 1730s that immigrants began to be admitted to the Livery and Huguenot names began to appear on the Company records—like Duthoit, Ouvry and Ogier. 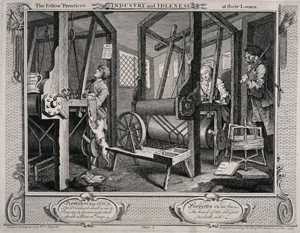 Eighteenth-century London, but it was beset by problems of fluctuating trade, foreign imports and competition which caused severe distress and consequent disturbances among the silk weavers. The greatest threat to their livelihoods came from the East. Indian textiles had been imported by the East India Company since 1621. These were silks and dyed and painted calicos used for clothing and furniture. They soon became very fashionable and were a serious threat to the home silk weaving industry. There were riots, attacks on East India House and violent disturbances. The Weavers’ Company deplored these and struggled to maintain order. It urged Parliament to restrict the imports. Acts were passed which attempted to help the silk industry, but with little effect. By the middle of the eighteenth century Spitalfields was a centre of poverty and disorder. After years of disruption by desperate workers in the silk trade a special Act was passed in 1773 to regulate wages, prices and employment in Spitalfields. This brought a period of comparative calm which lasted even through the strains of war following the French Revolution. It is interesting that the famous painter and engraver, William Hogarth, portrayed a weaver as the Industrious Apprentice, who worked hard, married his Master’s daughter and in due course became Lord Mayor. He might have been looking ahead to Samuel Wilson, who was born in 1792. He was apprenticed to Richard Lea, a silk weaver who was Upper Bailiff in 1791 and served as Alderman 1803-1808. Wilson was made free as a silk weaver in 1813, the year in which he married Jemima Lea. He was elected Alderman in 1831, Sheriff in 1833 and Lord Mayor in 1838. The Company made special arrangements to celebrate his election as Sheriff, sharing the cost of a barge for the river journey to Westminster with the Spectacle Makers, the Company of the other Sheriff. “A proper supply of Scarfs and Cockades” was ordered, flags, banners and livery gowns were provided and the Company dined at the London Tavern in Bishopsgate. When the bills came in, members of the Court of Assistants were shocked at the expense. Samuel Wilson was accompanied with due pageantry when he became Lord Mayor, but a barge was considered unnecessary since the Lord Mayor proceeded in the civic barge. Samuel Wilson would not have used Weavers’ Hall for any of the celebrations during his mayoralty because it was by then in serious need of repair and was no longer safe for large meetings, which were therefore held in the London Tavern. Dinners were often held down river at the Trafalgar Tavern at Greenwich or the West India Dock Tavern at Blackwall. In 1856 the Hall was pulled down and replaced by a block of offices. After the end of the Napoleonic wars a new spirit of free trade emerged and protectionist policies were abandoned. This brought a great expansion in the silk industry in Essex, in the North‑West and in the Midlands, where the new power looms, shunned in London, were being introduced, and where wages were lower. There were attempts to preserve the tradition of silk weaving in London. In 1888 Liberty’s arranged an exhibition of English silk with a special section for Spitalfields silks. A few silk manufacturers stayed on in London. In 1900 George Dorée in Bethnal Green sought the Company’s help in resisting the demolition of his weaving houses. The Company wrote to the Local Government Board and the houses were preserved and their craftsmen’s jobs saved. Dorée wove the velvet for King Edward VII’s coronation robes. A few workers remained in Bethnal Green into the twentieth century, weaving narrow fabrics and supplying trimmings for upholstery and decoration. During the nineteenth century the Weavers’, like many other livery companies, lost control of its trade and membership fell. Many companies vanished altogether and the Weavers’ Company’s numbers fell from a peak of over 6,000 at the end of the eighteenth century to below one thousand. In the first half of the twentieth century, members of the Company were still connected with the silk industry, but new blood was needed, and although a textile connection was looked for, an interest in the City of London appears to have been the most common characteristic of new Liverymen in this period, amongst whom were many distinguished men, including Prince Arthur of Teck, brother of H.M. Queen Mary and later the Earl of Athlone (Upper Bailiff 1919 and 1932). His wife, H.R.H. Princess Alice, Countess of Athlone, granddaughter of H.M. Queen Victoria, was much involved with the Company, becoming an Honorary Freeman. In 1930 the Company celebrated its octocentenary with a Court Dinner attended by H.R.H. Edward Prince of Wales and a visit to Brussels and Ghent, whence so many Flemish weavers had come to England during the middle ages. During the Second World War the Company was kept going by Dr. Geoffrey Radcliffe, Bursar of New College, Oxford (Upper Bailiff, 1929, 1941 and 1952) and the Clerk, Lawrence Tanner. The office building on the site of the Hall was destroyed and with it some panelling from the old Hall, but the Company’s portraits and silver had already been moved to a place of safety. The Court established the practice of meeting at the Savoy Hotel, which was more convenient for those members not away at the war. The Company considered rebuilding the Hall after the war but decided that this would be prohibitively expensive and that its money could be much better used. The site was sold in 1962 and the funds thus realised, together with a munificent legacy from Sir Cecil Bigwood, Upper Bailiff, 1911‑13, have enabled the Company to increase its charitable activities, its involvement with the textile industry and the scope of its entertaining. In the absence of a Hall the Company’s affairs were for very many years run from the places of business of successive Clerks, outside the City of London. Since 1994, however, the Company has been run from a fine office and committee room in Saddlers’ House, and its presence in the City and friendly association with the Saddlers’ Company have been a source of strength. There has been a conscious move towards involving as many as possible of the Company’s members of all ages in its affairs, not only by assessment of charitable applications but also by membership of committees and in other ways. The fellowship within the Company has also been enhanced in recent years by increasing numbers of visits to textile related places, both at home and abroad, for example Lille, lake Como, Oporto, Elgin and North Yorkshire.